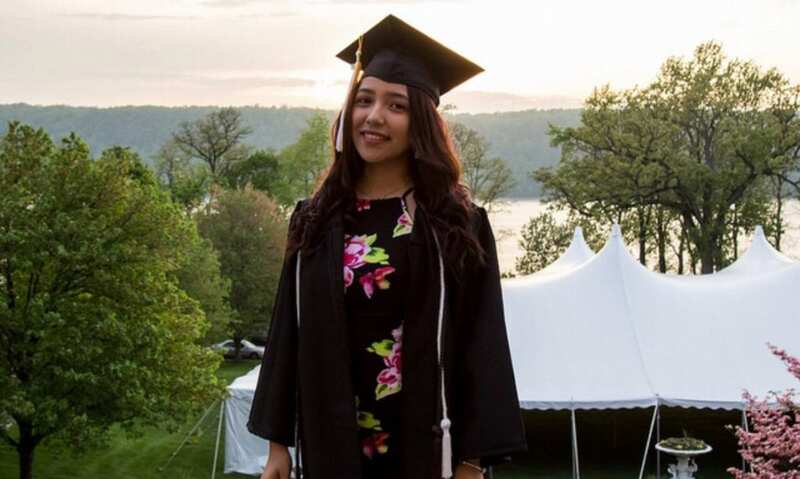 CSF Alumna Rose Huitzil recently graduated from the College of Mount Saint Vincent and is starting her career in television at Fox 5 News in New York. Hello everyone! My name is Rose Huitzil and I’m honored to write as a CSF alumna, having just graduated with my Bachelors of Arts in Communication and minor in Political Science from the College of Mount Saint Vincent. I’m happy to share my experiences as I look back at my education and how I got to where I am today. I grew up in the Bronx and my family is of Mexican descent. I can proudly say that I’m the first in my family to graduate from college, but let’s start from the very beginning. After attending a public school for a couple of years, I had the opportunity to receive a CSF scholarship to start fifth grade at St. Anthony’s School. My parents applied to CSF because they were looking for my siblings and me to get a better education in a safer environment. At St. Anthony’s, I noticed big differences. We had to wear uniforms, and there were more rules. I wouldn’t say it was strict, but you had to pay attention, you couldn’t misbehave. To me, having more discipline felt like a good thing. I graduated valedictorian of my class at St. Anthony’s and I chose to attend Preston High School, a private all-girls school in the Throggs Neck section of the Bronx. Unfortunately, I didn’t get to spend ninth grade at Preston because I was dealing with family issues and had to move to Chicago. My mother wanted the best for me so I enrolled at a private all-girls school there, Notre Dame High School for Girls. After a year, we moved back to New York and I was able to attend Preston. This was the second time I had transferred into a new school, and the transition was a bit rocky at the beginning because Preston is an academically challenging school. But with the help of my friends, family, and teachers who took time to help me after school, I was able to excel and enjoy my high school years. When senior year came around, the college application process was not easy for me. As a first generation, low-income student, I didn’t really have anyone in my family to turn to for help. However, I had a lot of support from my teachers and guidance counselors at Preston, and eventually I learned the ins and outs of applying to colleges and filling out financial aid paperwork. So a bit of advice to other students is to not be scared of the process. So many people are willing to help you out — people at your high school and even college administrators. Keep on trying, there is always a way! After getting accepted to all 12 of the colleges I applied to, I made the decision to attend the College of Mount Saint Vincent, which offered me almost a full ride in financial aid. Entering a new chapter in my life at the College of Mount Saint Vincent, I tried my best to get involved as much as I could by joining the Student Government Association and volunteering with A Moment of Magic, where students dress up as Disney princesses and visit sick kids in hospitals. I worked on campus as a tour guide and throughout college, I also completed many hours of service, including going to Kentucky to help rebuild homes in the Appalachian Mountains. Even though Preston had prepared me well for college-level work, I wasn’t sure what I wanted to study or do as a career. After taking all of my core courses, I decided to take a communication course where I would sit in a studio, in front of three cameras and a TelePrompTer, to read local news. My professor encouraged me to try my best and after my first couple of takes, I was looking forward to this one particular class every week. I realized I had found my career dream and I declared my major. Entering senior year, I had to find an internship that would help me get experience. After submitting many resumes and cover letters, I got an interview with Fox 5 News and eventually an internship. At Fox 5, I’ve been able to shadow reporters and even got to interview actor Chris Hemsworth on the red carpet! After graduating, I was offered a position to continue working at Fox 5 News, working at the news desk, assigning stories to reporters, learning the system, and doing what they need me to do. Eventually I want to become an anchor, and in this business, you really just have to start from the bottom and work your way up. When I look back, I realize the Children’s Scholarship Fund opened the door to many opportunities for me, especially helping with finances and lifting a burden off my family’s shoulders. I am the oldest of five and when I first received the scholarship, my siblings were just starting to attend school. My mom liked the advantages of private school but putting all five of us through school on full tuition would have cost a fortune. Not only did CSF open doors for me, but it helped open doors for my siblings as well. Now I see myself as a role model for them. I can help them as they apply to college and share what I have learned from my own experience. I really don’t know where I would be today without my CSF scholarship. Honestly, I might have dropped out. Applying and going to college was a challenge as a first generation and low-income student, but with hard work and help along the way, I overcame that challenge. I successfully obtained my Bachelor’s degree on May 19, 2018, twelve years after receiving the CSF scholarship that first got me started on this path, and I am very thankful for that.